Memorable moments take place while sharing food and drink with friends and family. 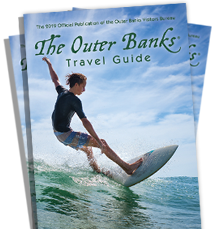 Fortunately, the Outer Banks has over 170 independent local restaurants of culinary delights in unique settings, with menus created by the most passionate chefs along the Atlantic Coast. From discriminating palettes and pocketbooks, Outer Banks restaurants serve a variety of fare; Southwestern, Steakhouses, Buffets, Grills & Pubs and Cross-Cultural cuisine. And yes, you’ll find NC Southern-style BBQ and fresh seafood harvested earlier that morning by an Outer Banks fisherman, working the waters as his or her grandfather and father did generations before.